Ambient fans will of course be aware of The Gatherings, the ambient concert series hosted by Chuck van Zyl of Star's End radio, which have become one of the preeminent venues for live ambient music in the world. 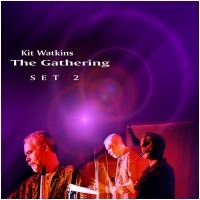 On March 10, 2001, Kit Watkins performed two stunning live sets at The Gathering, a live performance that has gone down in the books as one of the legendary ambient concerts of all time. In 2001, Kit released the recordings of his performance as two beautiful CDs, which are now available from Earth Mantra under the Creative Commons license. This particular release presents Kit's second set in its entirety. One critic summed these releases up nicely: "Recorded live at the 25th annual event of the same name in March of 2001, this collection of twelve solo pieces performed by Watkins showcases the man’s mastery of electronic music, and his in-depth knowledge of musical form. Each piece on the entire two CD set is a solid, self-contained work; a complete statement on and of its own." At the risk of being accused of hyperbole, our opinion is that the only thing that could possibly be better than these two releases would have been to be there for the live performance itself. Kit Watkins is justifiably loved the world over for his musical talent and ability to express himself through his compositions, but these two singular releases contain some of the strongest individual ambient recordings ever made, whether live or in the studio. The words "classic" and "essential" come to mind, and for once are completely accurate in their use. These two releases truly are essential, and in our opinion represent the pinnacle of live ambient music by any artist.